I spent some time thinking about frequent travel and loyalty programs. Flushed out some thoughts today at the Marketing Prof's Daily Fix. Please check it out, and let me know what you think! I've been writing for a few years about Best Buy and their successful attempts to become more customer centric. Here are two very insightful videos courtesy of Peter Hirshberg's Vimeo Channel. The first is Peter's interview with CEO Brand Anderson at Google's Zeitgiest on Best Buy's use of social media to empower the organization. The second is a video showcasing The Company as Wiki from Best Buy. All in all - Best Buy is an outstanding case study! Enjoy! I have it on very solid authority that Best Buy will soon be launching a customer listening / co-creation site that provides them with greater access to voice of the customer. Stay tuned for more great stuff! 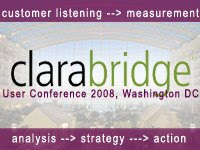 Last week, I spoke at the Clarabridge User Conference at the spectacular Gaylord National in National Harbor, MD. It was a great experience. Clarabridge is a company that provides incredibly robust text mining tools that also plug into Business Intelligence tools like MicroStrategy, Cognos and others. In short, Clarabridge's data mining solutions allow companies to mine structured and unstructured customer feedback to create highly robust views from any data repository. These flexible views of customer data help companies identify themes and trends -- enabling drill down into actual customer comments for increased context and insight. The technology is being actively used by companies like Intuit, Marriott, GAP and United Airlines, Gaylord Entertainment and other leading corporations. One of the things I noted from attendees actively using the tools was the claim that Clarabridge has driven significant business value, ROI and cost savings, even in early stages of deployment. That’s something that’s really nice to hear, and part of the reason I wanted to speak at this conference. I was impressed by the number of sharp people at this event. Most were mid-to-senior executive level leaders, working in Customer Contact Center, Marketing, Product Development or Operations. The insights they shared went far beyond how to use a tool like Clarabridge, extending into best practices for gathering and measuring customer insight, how to harness insights, rally the organization for customer-focused change, and the future applications of data mining technologies. I presented on the topic of “The Experience Enterprise” with other speakers including Colin Shaw, of Beyond Philosphy and Bob Thompson, founder of Customer Think. Clarabridge also assembled some terrific customer panels to harness insight “from the trenches,” which enabled attendees to harness lessons-learned and best practices from those working on the front-lines with the tools. In general, it was a great time to hear from the user community, check out new features and functionality, and discuss the future application of this type of technology in the field. Impacts of Down Economy. Participants agreed that while the coming economy is driving change in their organizations, customer intelligence solutions such as BI and Data Mining may not deeply feel the effects because of the direct value they provide to the business. This is good news for this technology sector and for companies working to become more customer-centric. Getting Started with Data Mining. Intuit’s recommended approach is to develop a proof of concept hosted at the vendor. Rather than purchasing, hosting and configuring the solution alone, starting with an “out of the box” configuration that can be applied across the organization. Identify and attempting to resolve a key issue by obtaining more meaningful customer insight. Once the insight is obtained, “tell the story” using real data, real quotes and trending. Use the tool to demonstrate how insights were obtained. Once the tool is embraced, roll it out within a targeted area with an eye toward a larger, disciplined deployment. Customer Surveys. Consensus is that companies are relying too heavily on post-service surveys. This creates a number of problems. First, the every day consumer /customer is being “surveyed to death,” resulting in frustration, filtering and lower response rates. Second, post-service surveys are reactive, in nature. While post-service surveys are a necessary evil, attendees agreed on the importance of gathering “in-stream” feedback from customers. Using this feedback, it’s possible to adjust course more proactively to better manage customers and foster retention of high risk customers. Net Promoter Score. Many attendees acknowledged the usefulness of the Net Promoter Score and also acknowledged that it may be too simple or narrow to drive meaningful insight into the customer experience. While it is highly effective in illustrating the outcome of a customer’s experience, it fails to illustrate what’s not working, what’s breaking down, and what could be improved to drive better success. Data Mining and Frontline Employees. Frontline employees are an incredibly important resource for providing customer-focused insight to companies. Using new tools and technologies like Data Mining are, potentially as useful when applied internally as they are applied to the external customer audience. Using the tools in this manner can also be quite economical. Listening to frontline employees and empowering the frontline with the tools and authority to solve customer problems is critical for future success. Balancing this need will be a challenge with the current economy. Data Mining and Social Media Channels. The application of data mining technologies within social media channels is the “next big thing.” As companies lose control of customer dialog, harnessing insights, trends and information from unstructured channels like Facebook and Twitter will be increasingly necessary and not without analytical challenges. Data Mining and Emotional Experiences. Leveraging data mining to extract robust information about how customers think, behave and respond emotionally to aspects of their customer experience(s), may be one of the next-generation applications of these tools. Developing the ability to recognize “warning signs” (based on emotional response) in customers and proactively drive risk mitigation tactics will become an essential component of designing good experience. Understanding the thoughts and emotions that motivate customer behaviors and drive employee decisions will play an essential role in designing and delivering future branded experiences. Data Mining and Customer Experience. Research shows that executives agree that Customer Experience will be the next competitive battleground in a rough economy. Providing good experience is highly operational in nature and requires a formalized approach that is driven from the top-down. Adopting a formal approach, including mapping key tasks and experiences, identifying gaps and developing a plan for improvement is critical. Utilizing new technologies to harness in-stream customer insight is an essential part of developing more meaningful, satisfying experiences. Difficult to summarize three days of discussion in one small post, but this is a feeble attempt. In summary, kudos to the team at Clarabridge for hosting their first user conference and an outstanding event. For those of you who are unfamiliar with the technology, I recommend a visit to the site and check out the Flash demo and use cases.